It’s Breakfast Week and what better way to start the day, than with Raspberry & Rose Cronuts™. Alright, so I’m joking, there’s nothing healthy about deep fried laminated dough, but they do taste pretty good. By now I’m sure pretty much everyone knows what a Cronut™ is. For those of you that don’t, it’s a croissant doughnut hybrid that is made by deep frying croissant dough that is shaped like a ring doughnut. Personally I love croissants and it seemed a bit wrong to take this wonderful butter rich dough and then deep fry it. However I put my principles to one side and I deep fried something for the first time in my life. I was nervous, the idea of heating a pan full of fat has never really sat that well with me. I was only burnt on the face a couple of times, after I learnt not to drop a Cronut™ into the oil from a great height. I’ve made croissants on the blog lots of times and while it’s a time consuming process, it’s well worth it. The process of making the dough is exactly the same for the Cronut™, a dough is made and then rolled and folded with butter to create rich layers that puff up when cooked. Making the dough takes about six hours in total, but you can make the dough the day before and leave it in the fridge, if the dough rises, just knock it back and roll it out to about 2cm thickness and then cut out circles that are 8cm in diameter. To make the ring you need to use a 1cm cutter and cut a hole in the middle, then leave them to prove somewhere warm for 2 hours. It’s very important that you cut the hole out of the middle as this not only gives them the signature shape, but it ensures they cook evenly also. Once the Cronuts™ have risen to twice their size, you can fry them in vegetable or rapeseed oil for two minutes on each side at 175C. Be careful when you come to pick up the Cronuts™ for frying as they are very soft and their shape will distort when you handle them. After the Cronuts™ have been fried you need to roll the sides of them in caster sugar, you don’t want to get any sugar on the top or bottom as you will be filling and glazing them when they have cooled. It took me a long time to settle on a flavour for these Cronuts™, raspberry and rose is a classic flavour combination, but I knew the Cronuts™ would be sweet and a little greasy, so I wanted a filling that could withstand that. I decided upon a creme patissiere filling, a rose flavoured glaze and a sprinkling of freeze dried raspberry powder. I found frying these Cronuts™ fiddly and they didn’t come out as perfect as I’d hoped, some of them rose unevenly while proving and this is accentuated further upon frying. 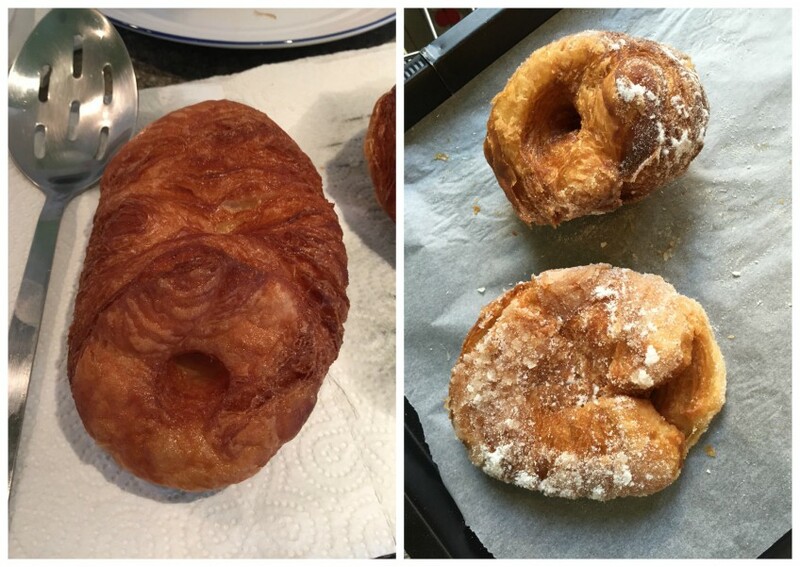 Here’s a picture of some of the less photogenic Cronuts™. 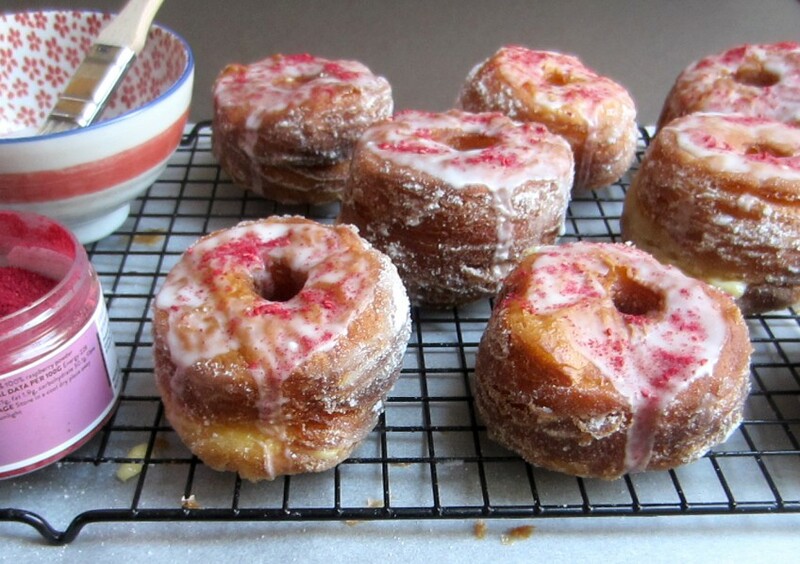 After the Cronuts™ were fried and rolled in sugar, I had to poke 4 holes in the base and fill them with creme patissiere, I then drizzled the glaze over the top of the Cronut™ and sprinkled the freeze-dried raspberry powder on top. These are time consuming and I’m not sure I would bother making them again, although I have a sweet tooth, I much prefer croissants to Cronuts™ and they are actually a lot less effort as you don’t need to worry about glazing or filling them. So here’s the recipe for the Cronuts™. 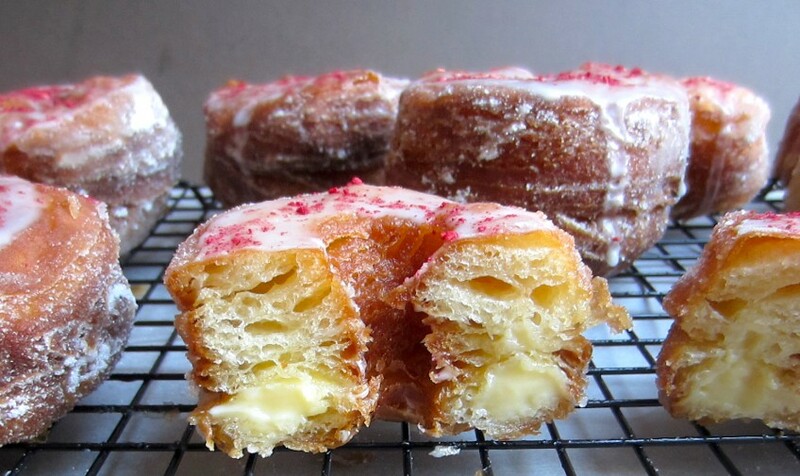 Cronuts are the well-known croissant doughnut hybrid made famous by Dominique Ansel in his New York bakery. These fried croissants are a very indulgent treat and I wouldn't recommend eating a lot of them in one sitting! Ten minutes before you begin working again, place the 250g of chilled butter in the freezer. Dust the chilled butter with flour. Roll out the butter into a rectangle half the size of the dough. If the butter is soft, roll it out between sheets of parchment paper that has been lightly dusted with flour. Arrange the dough with a short side facing you. Place the butter on the bottom half of the dough.Fold the top half of the dough over the butter to enclose it completely. Rotate the dough clockwise 90 degrees, so that an open edge is facing you. Roll out the dough lengthwise into a rectangle 6mm thick.Fold up the bottom third of the dough so it covers one third of the dough. Fold down the top third to meet the edge. This makes 4 layers of dough. Cover with plastic wrap and chill for 1 hour. On a lightly floured surface, arrange the dough with an open side facing you and the closed side on the right. Roll out again into a rectangle 6mm thick. Fold the dough in thirds, like a letter. There are now 3 layers of dough. Cover with plastic wrap and chill for 1 hour. Roll out the dough on a floured surface to a thickness of about 2cm and use a cutter to stamp out 16 8cm rounds. Then in the middle of each circle, use a 1cm cutter to make them into a doughnut shape. Place the ring doughnuts on a baking tray lined with greaseproof paper and leave them somewhere warm to prove until doubled in size (around 2 hours). 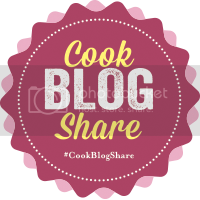 While the dough is proving, use this time to make the creme patissiere, combine the sugar and corn flour in a medium bowl and add the egg yolks. Whisk just until the sugar is combined, do not let it get too pale. Bring the milk to a boil and then whisk a third of the milk into the egg mixture to loosen it. Whisk in the remaining milk and return the mixture to the saucepan, cook over a medium heat, whisking constantly. As soon as the pastry cream begins to thicken, remove it from the heat and whisk in the butter until smooth. Scrape the pastry cream into a bowl and cover with a layer of clingfilm, pressing it down so it touches the surface of the cream. This will stop a skin forming, place the creme patissiere in the fridge and allow to cool completely. By now the doughnuts will have proved, before you start frying, get a bowl of caster sugar ready and some kitchen roll and place it on top of a cake rack. Heat a deep pan of oil (you'll need at least 1 litre of oil) to 175C and add two doughnuts at a time, cooking them for 2 minutes on each side, then using a slotted spoon place the doughnuts on a wire rack covered in kitchen roll. When they are cool enough to touch, roll the sides in sugar. Continue to cook all the doughnuts, making sure the oil stays at 175C the entire cooking time (you may need to tweak the heat for this) and dusting the sides in caster sugar. Once the doughnuts are all cooked, leave them to cool and then poke four holes in the bottom of them with a skewer or chopstick. Put the creme patissiere in a piping bag and fill the four holes with the creme patissiere. To make the glaze sift the icing sugar into a bowl, mix it to a thin consistency with the milk and then add 2 drops of the rose extract. Using a spoon drizzle the glaze over the top of the cakes and then sprinkle them with freeze dried raspberry powder. 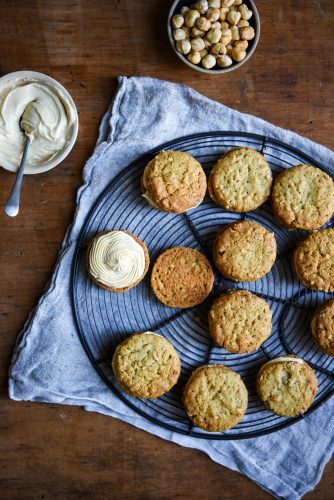 These will keep for a couple of days, but they are best eaten on the day you make them. 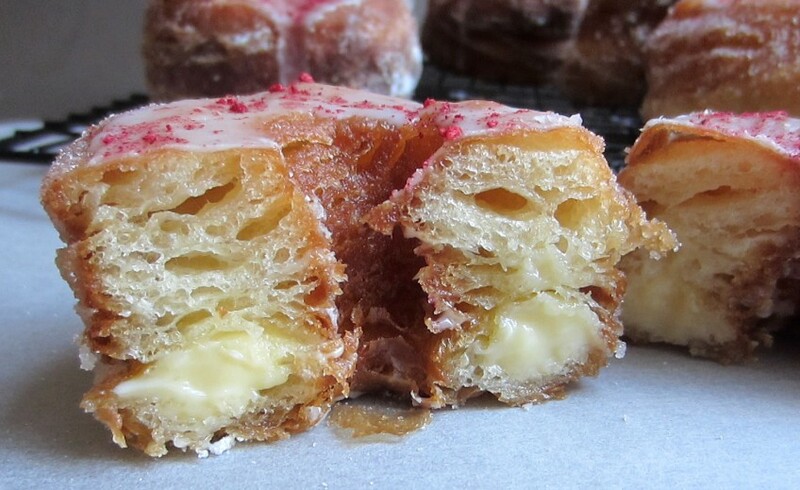 Have you eaten a Cronut™? If so, what did you think of it? Are there any other dessert hybrids you’d like to see? I personally like desserts with flavours that influence others, like a lemon meringue eclair for example, but for me, the Cronut™ is a step too far. WOW! 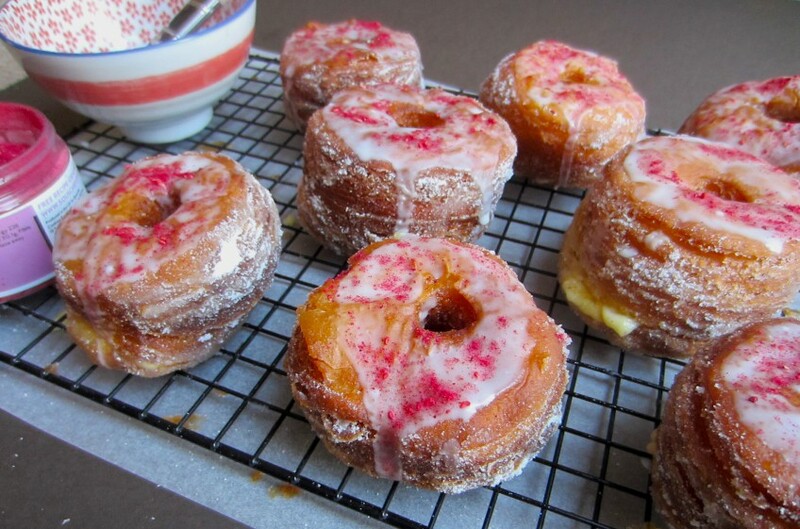 I actually think homemade cronuts can be incredible – better than anything I have tasted. My quick-method ones were actually completely perfect although maybe not as flaky as the proper method ones. Yours look perfect! I am drooling. I was initially sceptical as I love croissants and I really didn’t want to ruin them by frying them. 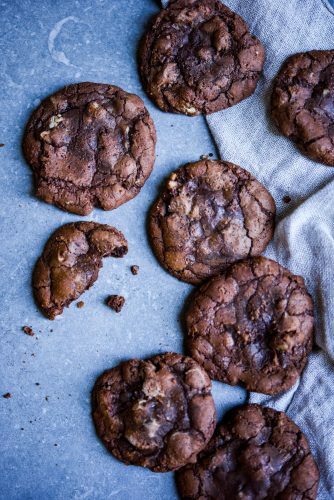 These are really nice, but they’re so buttery and rich that I would advocate eating more than one. 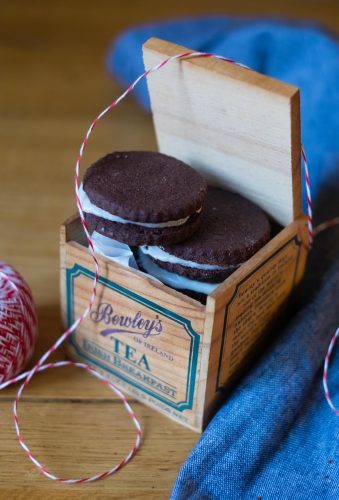 I saw that you’ve made these and like you, I initially swore I’d never make them again, but people seemed to love them! These are amazing! I actually love the combination of rose and pastry. I don’t think I could make these, I struggled with maintaining hot oil temperature with dough. The best I can do is plain old doughnuts! Great post though. yes I found the oil was either getting really hot or cooling off quite quickly. It took a while to fry all of these as I had to keep using my thermapen to check the temperature. The rose worked perfectly. I have to resist the urge to use it in everything now, I find it so delicious. Going on from your picture fails. I thought you’d appreciate my frying failures as well. I’ve been wanting to make these for a while, but not sure it’s worth the effort. However, curiosity might win one day, never say never, especially after seeing how good yours look! I was exactly the same Oana, they are a lot of effort and I have to admit I love croissants, so some of the glazing etc feels a bit unnecessary. They were tasty, but they are also essentially deep-fried butter! Glad you like the look of these! I love cronuts and I’m able to get them from my local farmer’s market oddly enough! This week they were filled with white chocolate and rose ganache and he makes chocolate and salted caramel a lot. These look delicious but I don’t think I could do it myself. They look perfect and I love the flavour combination! Jaye, this was my first cronut, I’m sure there are places nearby that make them, however I’ve never really sought them out. White chocolate and rose is a lovely combination. 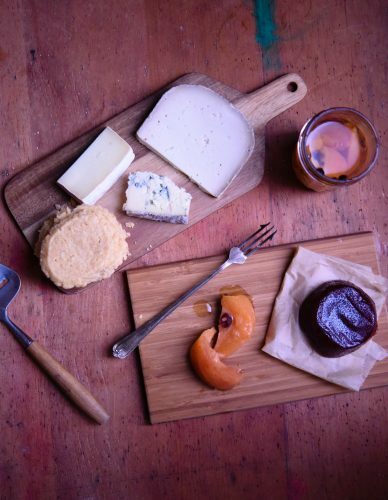 As long as it’s evenly balanced it can taste beautiful. 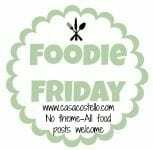 Thanks for the kind comments, whilst these are reasonably simple to make, I really didn’t enjoy frying them – all that hot oil just makes me anxious! I would recommend making puff pastry, croissants or Danish pastries first as a stepping stone to this recipe. I should definitely try croissants! I love them and I don’t like the idea of the hot oil either with my arthritic hands. Also, I’d only want to eat one cronut so it wouldn’t feel worth it whereas I could eat more croissants and take some to work for a small bake sale. I had lovely matcha croissants once. I should do that! Green croissants! wow these look sooo good especially with that creme pat in. Ive been wanting to try a cronut for ages. Thanks Rebecca, these were really tasty, but they were also a lot of work! I figured the only way I’d be able to try one, was by making them myself.